Perhaps now I really have seen it all. Just in case you need a computer screen danger garden of your very own (and who doesn’t?) I give you the link here. And yes, I am classifying this as a WWTT post, after all I haven't done one in awhile and really WWTT!!!??? It's not even the right cactus! Usually when I see this promoted, they're specifically mentioning Cereus peruvianus. It is technically correct, if misleadingly phrased: light, heat, and ultraviolet light are all forms of electromagnetic radiation, and cacti do absorb them, which is why we can't see through cacti. 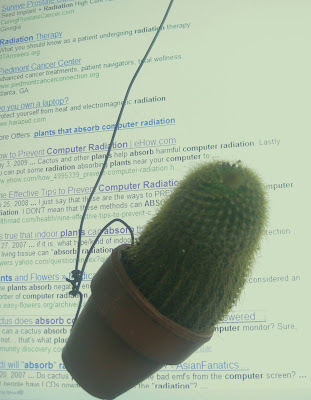 But I'm almost positive NASA wouldn't have done a study about this, because NASA would have no use for it; cacti wouldn't block all forms of radiation (I'm pretty sure they're transparent to x-rays and gamma-rays); and a freaking sheet of cardboard would block most radiation just as well as a cactus, if not better. So what were they thinking? They were thinking, we've got a bunch of these cheap $2 cacti sitting around; what could we tell people so they'll pay us six times what they're worth? Haha! That is the funniest thing ever! Magic cacti! What the EFsy? There's a bunch of new age crap that people are actually willing to buy, so this doesn't surprise me. I would really love the description to say "radiation absorbing cactus 'they' don't want you to know about!" I can tell you what they were thinking. There are gullible people out there and it's time to cash in. LOL Too funny! Mr S, well I am impressed that you know about this phenom...I hadn't a clue. I wonder how many they've sold? Greensparrow, exactly! I'm glad you appreciate it. Grace, unfortunately you are probably right. I wonder how many monitors have been scratched by these cactus?